"We gave these puzzles as a gift. It was very much appreciated." Top quality construction printed on heavy cardstock. Cover and back printed on 100lb (250gsm) cardstock. Inside pages printed on 70lb (100gsm). Whether you are looking for a gift for someone special or something for yourself, personalized paper notebook gifts and customizable photo diary are perfect for everyone on your gift list at an affordable price. Our wire-bound A5 size custom print notebook features sturdy front and back cover and you can choose between lined or non-lined paper for the page. To create your personalized notebook, choose photo notebook from the menu, select template you like for the cover, inside front, inside back and the back of your notebook and upload pictures from your computer or favorite photo-sharing site to our builder. You can then use our online editing tools to drag and drop pictures and add your custom message to the template. With all these options, you’re sure to create the notebook that’s right for you and for your gift recipients. 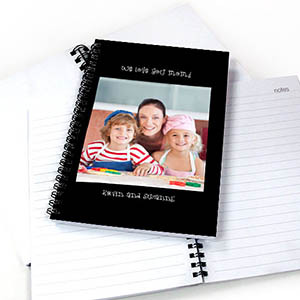 Cheap personalized notebook work great as wedding favors, birthday gifts, graduation gifts and family reunion gifts for kids.